BEST Keto Fried Chicken — Crispy, Crunchy + Delicious! This keto fried chicken recipe is here to show you that the best fried chicken doesn’t come in a bucket, a frozen container, or from a restaurant chain — it comes from your kitchen. All you need is a handful of low carb foods and the right technique to achieve that moist, crunchy, dippable keto fried chicken we all love and crave! 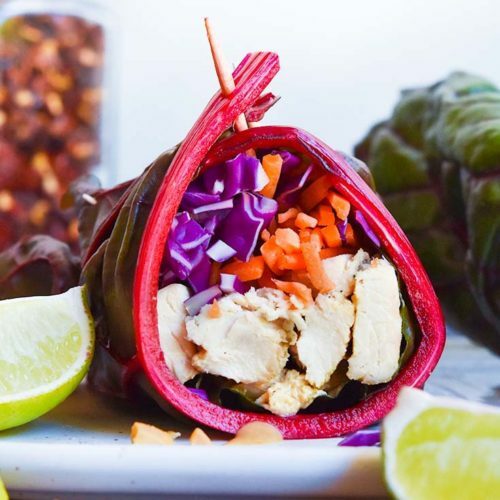 In my house, this low carb recipes quickly become a family favorite, as it’s easy to meal prep and adjust to whatever low carb side dishes you serve it with. Trust me, once you try this keto fried chicken, you’ll quickly wonder why you wasted a carb on the other stuff! So turn on that oven and let’s make some keto fried chicken! Did you know that 1 serving of Popeye’s fried chicken had 21.5 grams of carbs? 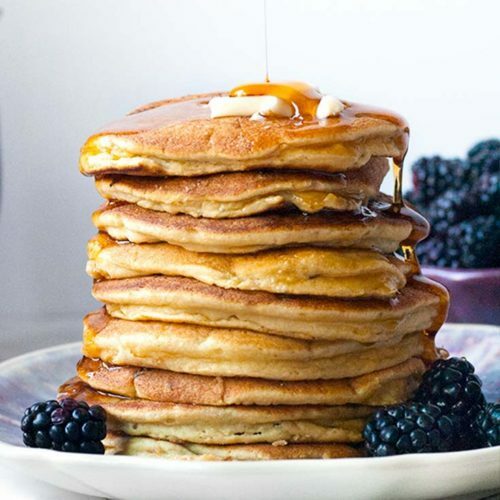 In fact, it has more carbs than protein — crazy right? Now this keto fried chicken is a totally different story. To save ourselves some carbs, we’ll swap the flour used in traditional recipes for our very own crunchy low carb shopping list ingredient: pork rinds. The beautiful reason behind using pork rinds in this keto fried chicken recipe, is that they’re already fried! So we don’t have to deal with splashing oil, fry screens and kitchen thermometers — all that’s required is to place the keto fried chicken on a baking sheet and plop it in the oven. I know I may have lost some of you at pork rinds. And before you run away, let me point out that we eat chicken skin all the time, so why does pork skin get the stigma?! It can be rather tasty once you find a brand of pork rinds you like — in fact, they may be a game changer for your low carb meal plan! 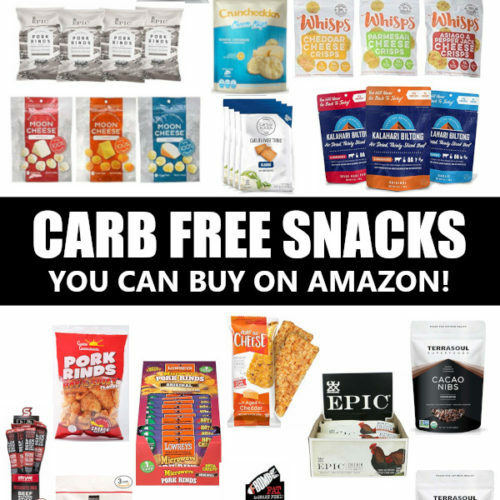 I used to avoid pork rinds at all costs — then I found these Epic Pork rinds that I love so much, I even eat them for low carb snacks! I’d also like to mention that, yes, you can make keto fried chicken almond flour or keto fried chicken coconut flour — both low carb flours make for a decent flour replacement in many recipes. But when it comes to fried chicken, they don’t give you the same crunch as keto fried chicken pork rinds! What Part of the Chicken Do You Use? 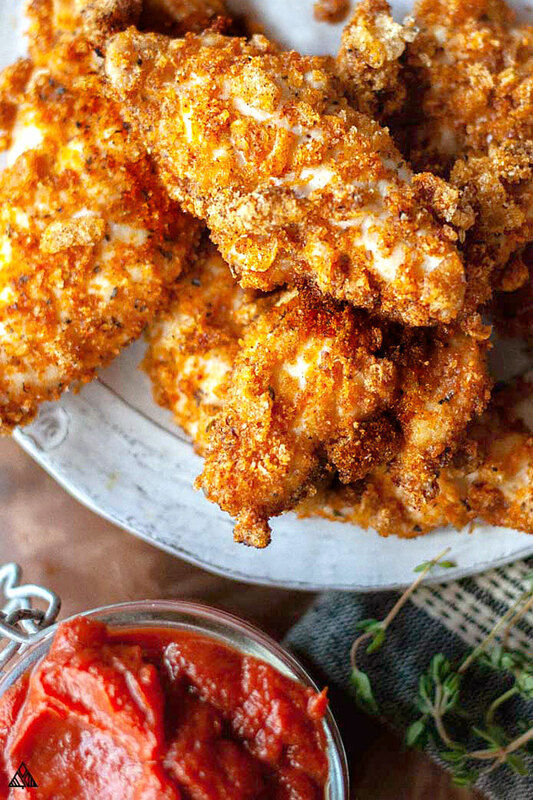 The bake times and recipe instructions below are for keto fried chicken breast — however the same breading can be used to make whatever you’re craving! From keto fried chicken legs to keto fried chicken tenders to keto fried chicken thighs. Bake times will vary based on the type of meat and thickness you choose. To complete your keto fried chicken meal, serve this with classic low carb coleslaw, pickle keto coleslaw, cauliflower potato salad, or sauteed collard greens! 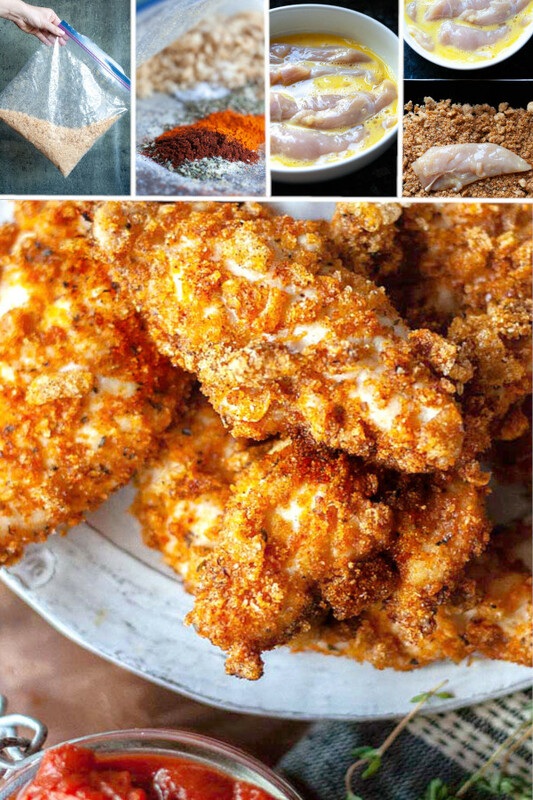 Keto fried chicken is one of the most versatile of dishes — use it to make low carb chicken parmesan, fried chicken salads, low carb tacos, you name it! Did I forget your favorite? Let me know in the comments below! This recipe and instructions can be used to make adorable little keto chicken nuggets — which is my preferred way of eating keto fried chicken. You’ll want to bake your nuggets for 20-22 minutes — until the center is no longer pink. 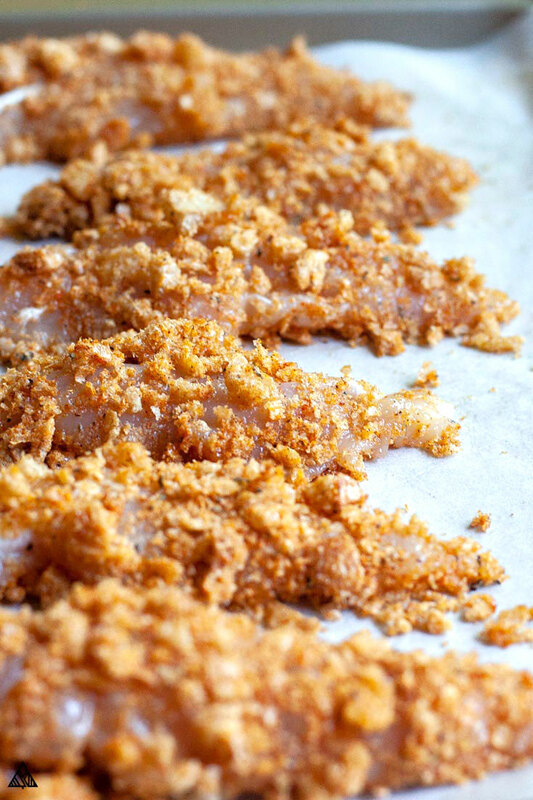 Meal prepping these low carb chicken tenders is the BEST, and has saved me from boring low carb take out on many occasions — they’re easy to freeze and quickly defrost in the oven when you’re hungry — meaning crispy, crunchy, keto fried chicken everytime. 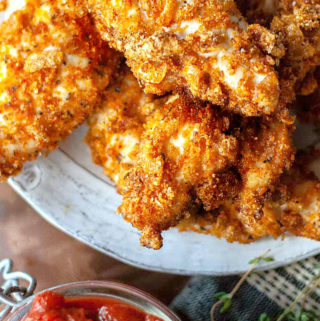 I borrowed this low carb meal prep idea from Epicurious’ Sunday Stash — of course, converting their panko crusted recipe into this keto fried chicken variation. To summarize: “bread” the keto fried chicken, place them on a baking sheet and freeze for an hour. Once firm, place the chicken into a resealable bag. Next time you’re craving keto fried chicken, you can bake it from frozen for 24 minutes, or until there’s no pink left in the center! I can’t wait to hear what you think about this keto fried chicken recipe! Let me know in the comments below, what’s your favorite fried chicken dip? Did you try any variations? 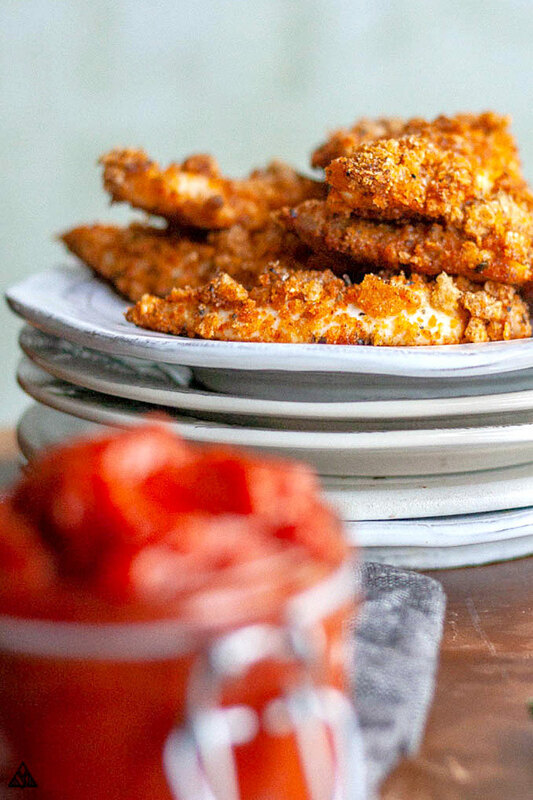 These crunchy, dippable and delicious keto fried chicken tenders are here to show you that the best fried chicken doesn't come in a bucket. Preheat oven to 400 F and line a baking sheet with aluminum foil. 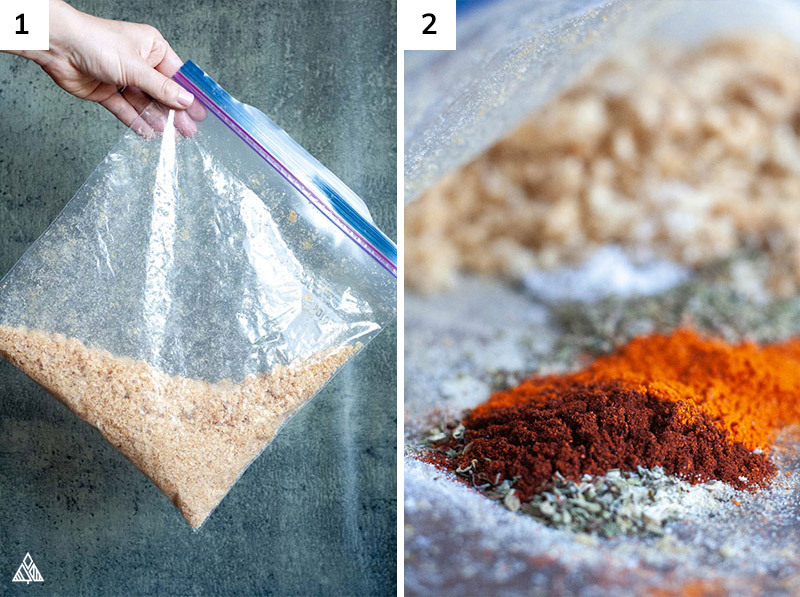 Place pork rinds in a resealable bag and crush into a panko sized grain. Be sure to leave a few large pieces. Add thyme, salt, pepper, oregano, garlic powder, and smoked paprika to the bag and shake a few times to combine. Pour the pork rind combo in an even layer on a flat plate. Beat eggs is a wide mouthed bowl. 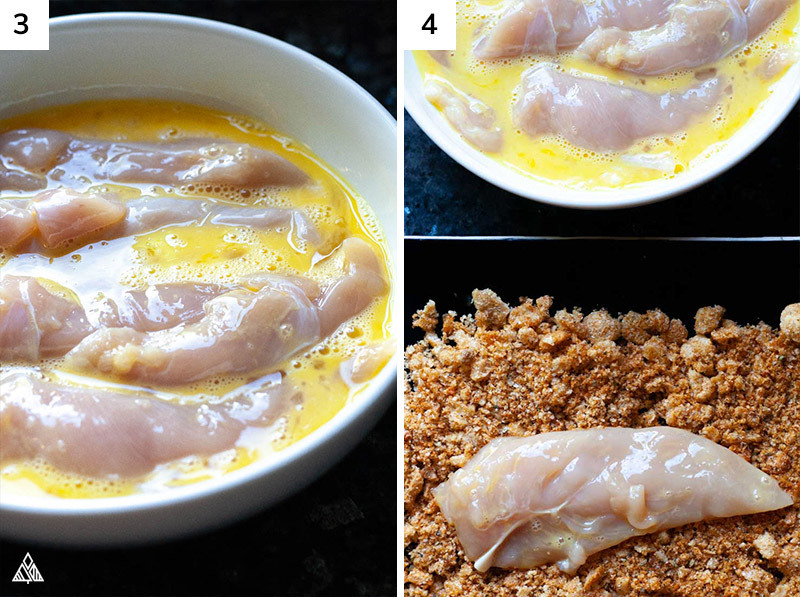 Dip chicken into the eggs, then into the pork rind combo — make sure to evenly coat all sides. Place chicken onto prepared baking sheet. Once all chicken tenders are evenly coated, bake in the oven 24 minutes, or until chicken is cooked all the way through. Allow chicken to cool and serve with your favorite dipping sauce. Enjoy! I made these with the spicy pork rinds along with some Carbquick waffles with sugar free maple syrup.SO GOOD! There’s no mayo or Dijon listed in ingredients list but in instructions it’s mixed with the Egg mixture to dip chicken in? 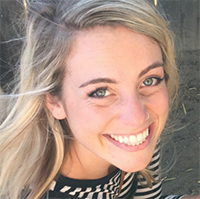 Hi Ivey! So sorry about that, I originally tried mixing the egg combo with mayo and mustard, and realized it worked better with just eggs. I’ve updated the recipe to reflect the changes. Hope you enjoy!! I made the Keto fried chicken and it was amazing… This will be a must to make a few times a month! Thank you for the reciepe! Yay!!! SO happy to hear that Tammy! I didn’t see how much mayo or Dijon mustard to use. Thanks! So sorry, I originally tried the recipe with both of those ingredients but decided to leave them out, as they’re didn’t add anything to the dish. I’ve edited the recipe to reflect the changes. Hope you enjoy! How many servings. How many oz. do we get for the calories? Hi Linda! There are 8 servings in this recipe. Enjoy!! I haven’t tried this yet, but will soon. I notice in the “meal prep” section you say to bread and freeze them, then bake for 14-16 min, but the main recipe calls for baking them for 24 min. Are you freezing them AFTER baking? Hi Matt! Thanks for catching that, and sorry for the confusion! You will bake them for 24 minutes from frozen, I wrote the wrong times in there. Hope you enjoy! I’m so happy to have found you. I crying with happiness now, I found out almost 6 months ago I have type 2 diabetes. My world consist of no carbs and no sugar. I have a lot of weight to lose and again I am blessed to find this incredibly awesome site. Thankfully I can lose weight and not be deprived. So happy. I made the chicken salad and it’s just melts in your mouth with the quilt. I’m sorry to hear that Paula, I felt the same way when I found out I was diabetic, I mean a life without desserts is heart breaking! Then I tried this stuff, seriously, don’t even miss the real thing. I hope you enjoy as much as I do! Loved this! Your seasonings were perfect.